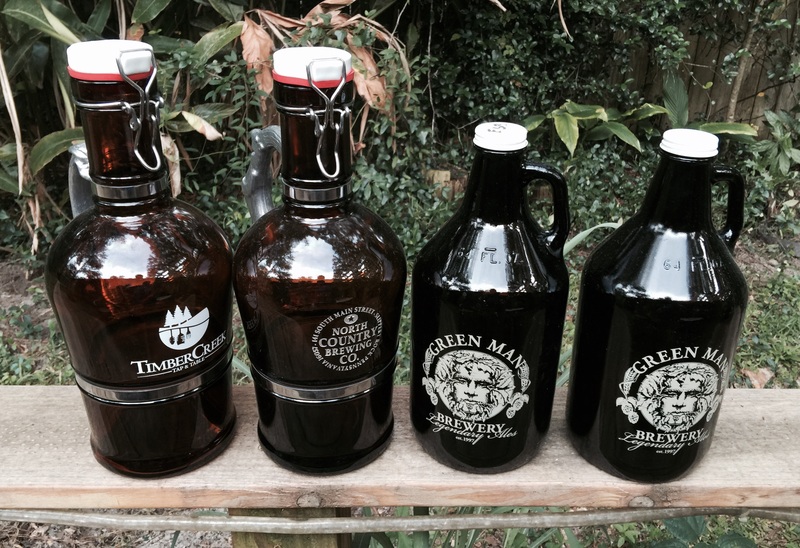 Happy Growler Day – Craft Beer in Florida gets a big WIN! If you have ever been to any of the craft breweries in the United States you have either seen someone buying beer to take home or you yourself have taken beer home in containers called growlers. Now the most common size for a growler in 47 of the states has been 64 ounces (half gallon). Some breweries also have other sizes (32 oz. – or quart, and 128 oz. 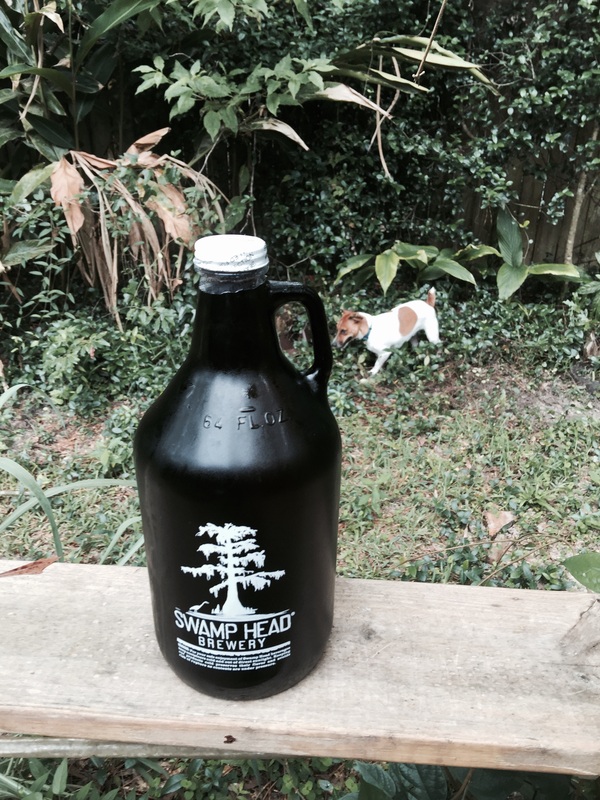 – or gallon) but the most popular size Growler has been the 64 oz. In fact, if you try to buy growlers over the internet you are hard pressed to find sizes other than the 64 oz. This may be due to the fact that the smaller growler is really only equivalent to two pints of beer and the gallon is really too much and beer will probably go bad before your get to the end of it. I had a little soiree a couple months back with four half-gallon growlers of beers from North Carolina and Pennsylvania, about six pints of my own home brew and a wine bottle sized container of a Cuvee (see pic above). And with ten beer drinkers in attendance I had still had a little beer left over by the end of the day. If I had bought quart sizes I wouldn’t have had enough and gallons would have been way too much. Now, until this recent July 1st you could not get a half gallon growler anywhere in Florida and you couldn’t bring one from out of state and have it filled. You had to purchase a quart or gallon size to have them filled if you didn’t already have that size. If you were a visitor from out-of-state it probably ticked you off a little bit that you couldn’t refill the growlers that you brought with you and you may have even thought that the brewery was trying to rip you off. Nothing was further from the truth. The craft breweries wanted to be able to sell you half-gallon growlers and have been fighting the Florida legislature for five years to make that happen. 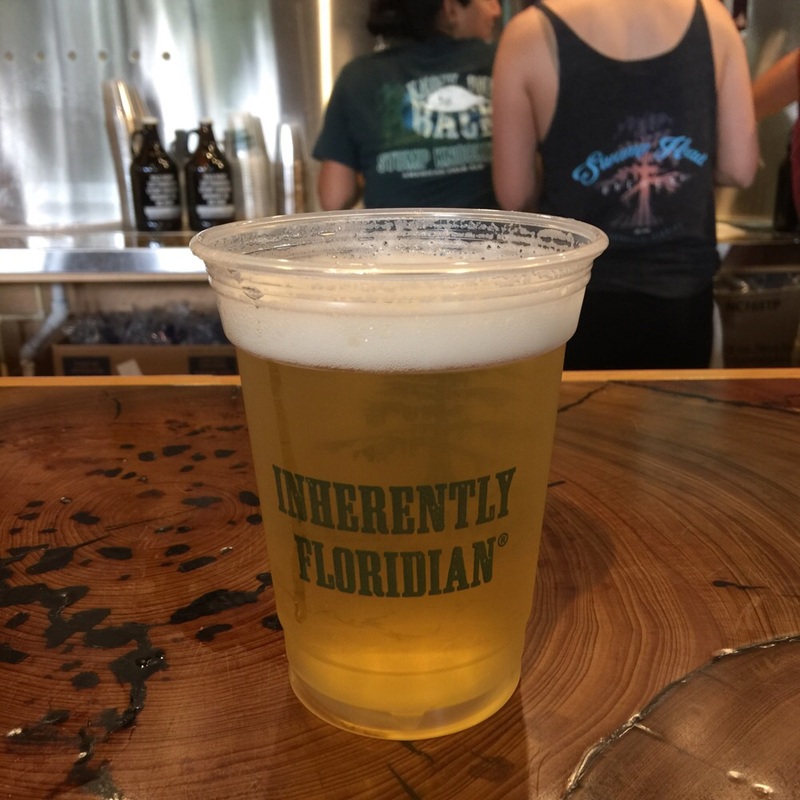 Florida State Senator Rob Bradley, (R-Fleming Island) has been one of the few legislators in Florida government who has been championing this cause for Craft Breweries. His opponents have been the big money Anheuser-Busch and MillerCoors distributors, the Florida Retail Association and another group composed of liquor stores. They used an interpretation of state law concerning the tourism industry to fight it because they feared losing more of their customer base to the burgeoning market of craft breweries and their tasting rooms. Florida has been known as an innovator for businesses and certain industries for many years. How ironic was it that when it came to the beverage industry we were so behind the times… too ironic for the tastes of many Floridians. And the truth is that the big money interests have been losing more of their customer base every year despite their fighting this change in Florida anyway. I don’t know what Senator Bradley’s politics are outside of this issue, but I will definitely say that for small businesses and for craft beer lovers he did us all a favor. I don’t know about the rest of the State but if it was anything like Gainesville then all of the breweries had their hands full keeping up with customer demand on July 1st. My friends and I had received Facebook invites from Swamp Head and First Magnitude Brewing here in Gainesville. First Mag’s invite was kind of last minute as we had already decided to go to Swamp Head, but I was hoping to make it to First Magnitude later. The crowds at Swamp Head brewery on July 1st – Growler Day in Florida! It was a packed house from the time I arrived until well after I left, parking was at a premium, with folks coming in, supping a pint or two and then buying their growler (or growlers) and going home. My friends the Chemist and his wife, the Deck-orator, were able to secure a few barstools but there were no tables available. And the Wetlands bar was so packed with folks waiting to get pints and growlers filled that it was much easier to go to the back bar on the loading dock to get a pint. Luckily for me they had three different Catherine’s Passions brewed for the night (Caramelo, Mounds and Reece’s). If you have never had a Catherine’s Passion they are a very smooth and tasty Imperial Russian Stout. The variety they were serving that night also had a candy bar theme going on. The Chemist had a Caramelo which he said he liked. I ended up with a Mounds variety. I don’t like Mounds candy bars because I don’t like coconut. But I did like this stout. It was very smooth with a hint of chocolate and just tasted great. The Doctor and Rowdy showed up shortly and joined us. Rowdy didn’t care for the stout but she doesn’t usually like most stouts because of the coffee flavor a lot of them have. We sat around supping suds and philosophying while we watched the ebb and flow of people coming in to get growlers. I finished my stout about the same time a lull in the crowd at the bar opened up. So I went to get another pint. This time I went for Swamp Head’s seasonal Hydroslide, which is a Kolsch style beer. I have had this before and thought it was good the last time, and my thoughts didn’t change with this season. This is one of those beers you’re really glad to have on a hot summer day, which in Florida can last longer than you would like. If fact I liked it so much I decided to get this in a growler instead of one of Swamp Head’s flagship beers. One: Because I knew I would be working around the house this weekend and wanted something refreshing for when I was done. And Two: because it doesn’t come around but once a year. My first 64 oz growler purchased in Florida! Once I came back with a growler my friends decided to get theirs as well. Rowdy got the Hydroslide too. The Chemist and the Deck-orater got two growlers of Big Nose IPA as well as a case of Big Nose in cans, which is a recent addition to Swamp Head’s canned offerings, though they have been serving it in kegs for a while. If you really like hops, you will love Big Nose. Not long after we all got our growlers we started making our way home and room for others who were still filing in to get their growlers. I attempted to go to First Magnitude on the way home from Swamp Head, but I wasn’t able to find any nearby parking so I decided I will have to go there another time this weekend instead. I may buy one of their growlers or I may take in one of my empties from out of state and get it filled instead, I’m not sure yet. But it’s just so nice to have the choice now. If you’re reading this and you live outside Florida and have been thinking about visiting some breweries here, then come on down! If you like, bring your growlers with you… we can fill ‘em now! 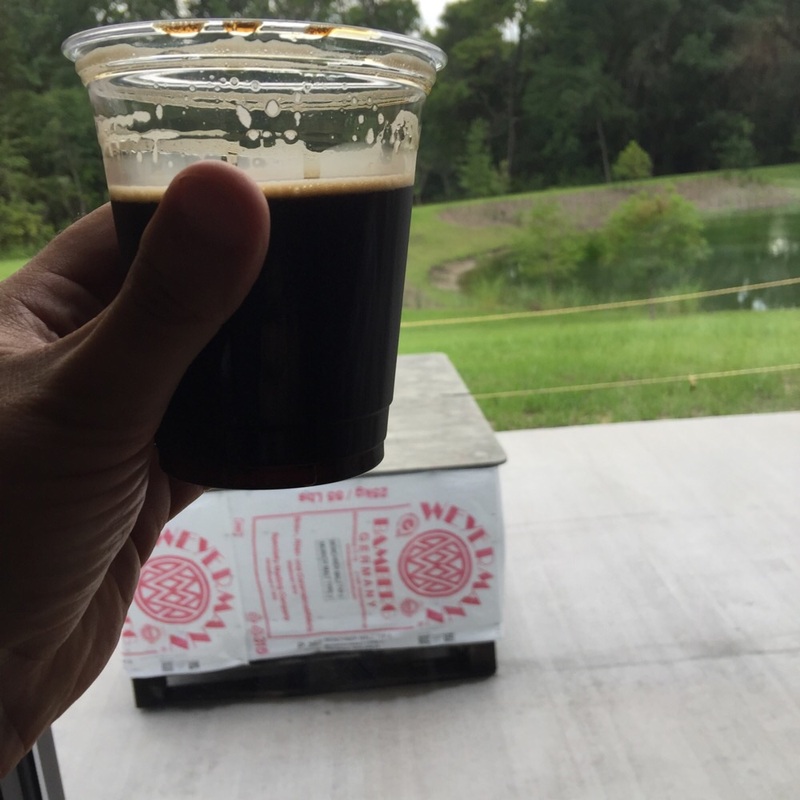 Posted on July 2, 2015 Categories home brewingLeave a comment on Happy Growler Day – Craft Beer in Florida gets a big WIN!